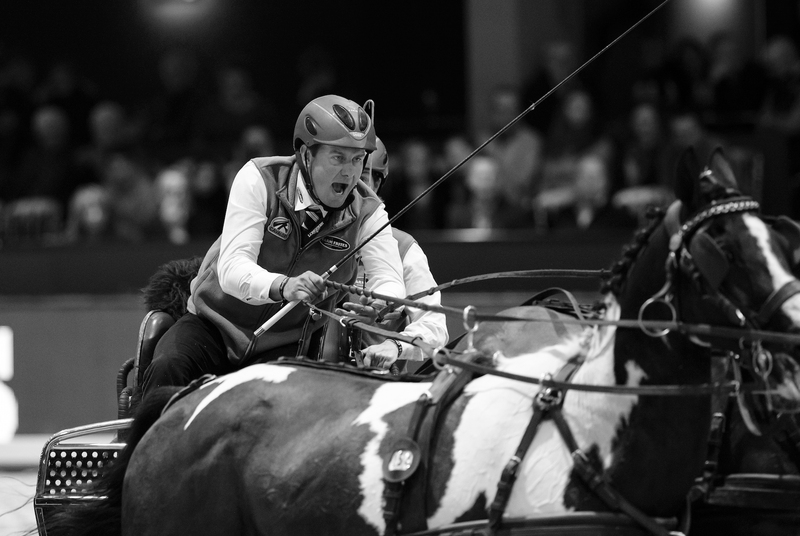 Australia’s Boyd Exell took the crown this weekend in Bordeaux at the to mark his eighth FEI World Cup™ Driving Championship title. Exell and his team sped around the course to victory nearly five seconds ahead of his closest competitor in a nail-biting drive off. Exell’s superb horses, with seasoned leaders that had won previous World Cup titles, charged through the course, heads down and all business, as focused as their human driver in this competition of speed, precision, concentration, and communication. Exell’s navigator Emma Olsen and his backstepper Hugh Scott-Barrett performed a ballet on the back of the carriage, shouting directions and leaning dangerously off the edge to shave seconds off the clock. The effort was worth it. Exell completed a clean run with a time of 297.42, having carried over 154.55 seconds from the first round just minutes before. Jérôme Voutaz of Switzerland had laid down a brilliant time to beat. To say Exell is a legend in the sport of driving is not an understatement! The podium at Bordeaux this year was reminiscent of last year’s final, with Voutaz snagging second place again and Koos De Ronde of the Netherlands repeating his third-place finish. Voutaz started his drive off with 155.18 on the clock and worked the course for all it was worth, going clear to the bridge and finishing in a rapid time of 302.91, including five penalty seconds picked up in the second half of the course. Competing with a bad back that he had to put out of his mind for the perilous three minutes he was in the arena, Voutaz was thrilled with his ride and jumped off the carriage at the finish to reward his horse team for their performance. De Ronde, who began with 158.23 and picked up five penalty points early on, did his best to make up time, his horses kicking up sand and wheels churning, for a final time of 315.89 and 10 penalty seconds. De Ronde, the 2013 FEI World Cup™ Champion and member of the Dutch winning team at the 2014 FEI World Equestrian Games™, is always a force to be reckoned with. The course was a tricky one, designed by Jeroen Houtermann of the Netherlands, his first time building a driving course for an FEI World Cup™ final event, after completing several courses for this season’s qualifying legs. With two sets of obstacles, nine pairs of cones, a bridge, and a speedbox, the layout tested the world’s best drivers as the bell rang and the rock and roll music ratcheted up the excitement. Bram Chardon of the Netherlands can be proud of his fourth-place finish and time of 159.35 with 10 penalty seconds, which placed him just narrowly out of the drive off in his first FEI World Cup™ Final competition. It was a family affair for the Chardons, with Bram Chardon’s sister Lianne in his navigator’s position and his grandfather Abraham, for whom Bram was named, in the audience to cheer the pack on. Also competing in the event was four-time World Champion and 12-time Dutch champion Ijsbrand Chardon, Bram’s father, who finished fifth with a time of 160.25, including five penalty seconds. 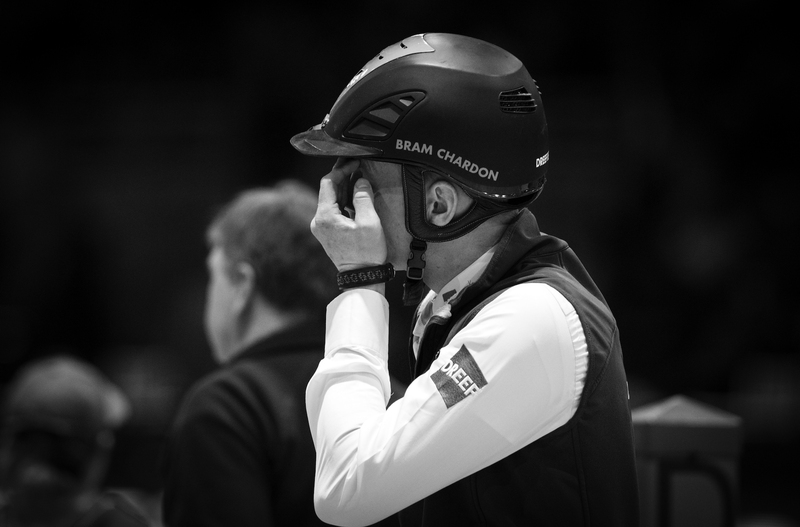 Sixth place in Bordeaux fell to Glenn Geerts of Belgium, who showed gorgeous turns through the obstacles and a clean run through the speed box, only to knock down the last ball on the course for five penalty points and a time of 163.92. Wildcard entrant Benjamin Aillaud of France had the home crowd on his side and can be pleased with his seventh-place clean run as a rookie in FEI World Cup™ Final competition and his final time of 172.06. While not enough to make it into the drive off, Aillaud’s showing did well for the host nation at this spectacular event. What does the future hold for FEI Driving in 2018? Stay tuned to FEI TV to follow these top drivers and new up-and-comers for what is sure to be a year of the best horsemanship yet!